It’s mid October; we’re eating pole beans from the garden, and half the nasturtiums are still in bloom. But even on a grey day, the Black Gum outside my office window glows scarlet, orange and yellow, heralding “Fall is Here”. Nowhere is fall more evident on a cider apple farm than the tank room—ripe apple smells from recent pressings, yeasty aromas from active ferments create a olfactory stew in the Cider House…the unmistakable nose of the season. Fine cidermakers like our friends and colleagues at Farnum Hill Cider, Eve’s Cidery and Eden Ice Cider use apples specifically selected for cider, and most often blend several varieties to achieve complexity and balance. Foggy Ridge Cider firmly resides in the blending camp—in our view, the most complex, balanced and interesting cider is a blend of several apple varieties, all chosen for their contribution to flavor, texture and balance. But why blend? And which apples? 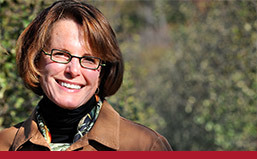 The erudite and always insightful wine writer Jancis Robinson states, “If two or more genuinely characterful grape varieties are blended together, and compliment each other, then the result should be more interesting than any single-varietal component.” Robinson explores the reasons behind blending in her informative article. The Foggy Ridge consensus is “blend for flavor and balance”, not (as Robinson states) for “commercial expedience”. 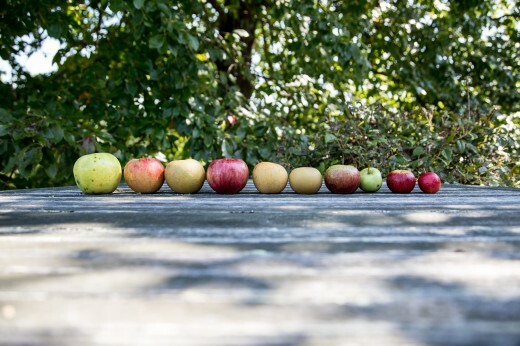 Planted in 1997, the Old Orchard at Foggy Ridge tested over 30 apple varieties for those two crucial qualities—which apples grow well, and which apples (grown on this site) produce fine cider. I practice Tough Apple Love….Nehou, a widely grown cider apple in England and a favorite of an early cider mentor, headed for the burn pile when it grew like a beast and produced little fruit. Calville Blanc D’Hiver, though delicious in cider, was far too high maintenance, as is the tart Esopus Spitzenberg (though I keep one tree for my eating pleasure). 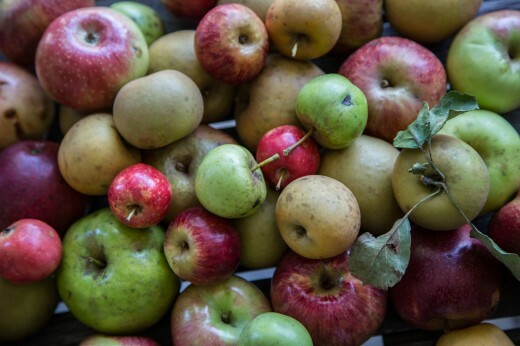 Jonathan and Ashmead’s Kernel have to do the acid heavy lifting in Foggy Ridge’s cider. 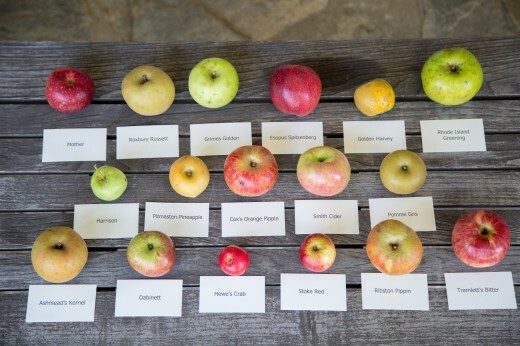 Seventeen years later, we’re still learning about which apples to grow, and how to blend for flavor. When it comes to understanding apple varieties and cider blending, our fast growing US cider industry is an infant. Only 260 years ago, Thomas Jefferson grew Hewe’s Crabapples down the road at Monticello and blended them in his famed Virginia cider. Bordeaux wines gained popularity in the 12th century; the Basques introduced cider to Normandy mariners in the 6th century and one of the first mentions of Normandy apple tree was in the year 862. While we’re happy with our line up at Foggy Ridge, we’re still very low on the learning curve. But all it takes is patience and practice…I encourage new cidermakers to resist the urge to blend hops, blackberries and bourbon barrels into insipid base ciders. Instead, plant, ferment, taste and learn. At its best, cider is a farm beverage. Forget the flavor additives…plant and learn!